There are actually two types of pinene, alpha and beta. The alpha variety carries a scent of pine needles or rosemary; the beta type smells like dill, parsley, rosemary, basil, or hops. Like its terpene cousins myrcene and limonene, pinene is found in many non-cannabis plants. In fact, it is the most common terpene found in the plant world. Pinene’s medical efficacy includes increased mental focus and energy. It also acts as a bronchodilator, making it helpful for people with asthma and other respiratory ailments. In addition, it can be used as a topical antiseptic. Probably the most promising application of this terpene, however, is its power to reduce the size of cancerous tumors. Pinene’s magical power is derived from its ability to cross the blood-brain barrier. Once in the brain, it affects existing neurotransmitters in such a manner that it results in better memory. 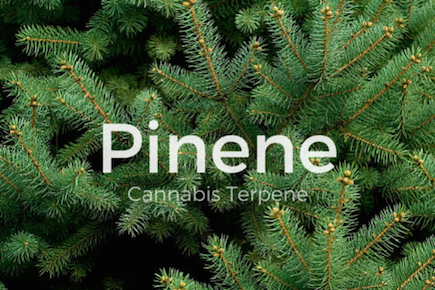 Pinene has also shown to inhibit the influence of THC, an example of the entourage effect that may result in a decrease in paranoia or adverse psychological reactions from this cannabinoid when consumed in large quantities. The power of pinene is nothing new. For literally thousands of years, many cultures around the world have used plants containing large quantities of pinene, like rosemary and sage, for the preservation and enhancement of memory. It’s only today that researchers have a minor understanding of how pinene accomplishes this in the brain. Probably the most significant result of the limited research conducted to date is that pinene — and all terpenes — act in a synergistic manner with other terpenes, as well as cannabinoids like THC, to provide medicinal efficacy for those suffering from a wide range of diseases, especially cancer. Of course, more studies are necessary before doctors and budtenders can begin recommending cannabis strains high in pinene for such ailments.